FlightSafety and Gulfstream have worked together for more than 50 years to develop comprehensive pilot and maintenance technician training programs for practically every Gulfstream aircraft model. Our highly qualified and experienced instructors, advanced-technology flight simulators and integrated training systems help ensure proficiency and safety. We offer Gulfstream G450 training at our Learning Centers in Dallas, Texas; Long Beach, California; Savannah, Georgia; and Wilmington, Delaware. FlightSafety enjoys a strong relationship with Gulfstream that is built around our training programs for the full line of Gulfstream business jets. FlightSafety Learning Centers offer professional pilots and maintenance technicians of Gulfstream G450 aircraft the resources to achieve proficiency and safety. All of FlightSafety’s Gulfstream training programs meet the same high standards, regardless of aircraft model. Learning Centers for Gulfstream business aircraft are located in Dallas, Texas; Hong Kong, China; London Farnborough, United Kingdom; Long Beach, California; Savannah, Georgia; and Wilmington, Delaware. FlightSafety’s Master Aviator Award is now available for Gulfstream G450 operators. To become a Master Aviator, complete a series of Advanced Training courses and electives and complete a FlightSafety training or checking event every eight months. FlightSafety’s Advanced Pilot Courses are based on analysis of actual incidents – helping to develop solid flying skills, swift and accurate decisions, and precise crew communication. FlightSafety’s VITAL 1100 visual system installed on many of our Gulfstream G450 simulators, offers unprecedented fidelity and the ability to deliver exceptional realism. This significantly enhances training by providing highly detailed specific imagery with vastly improved scene content, exceptional environmental effects, and remarkable levels of detail. 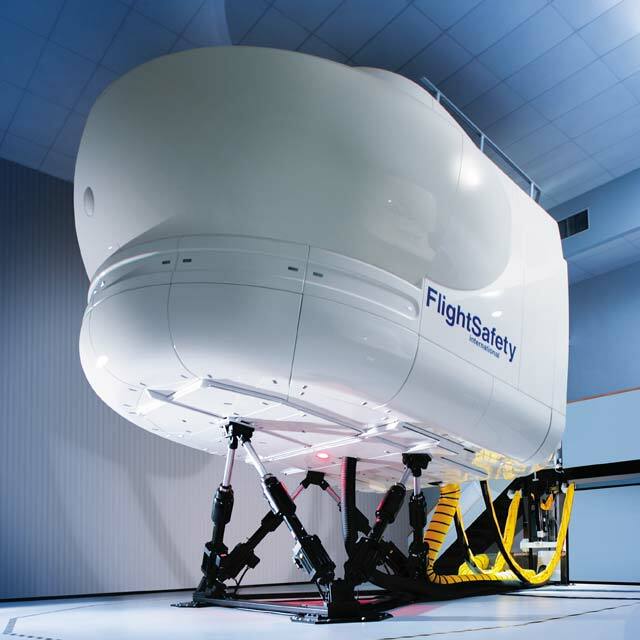 FlightSafety holds more simulator certifications on the G450 than any other provider: ANAC/CAAC/EASA/FAA/GACA/HKCAD/MDGAC/MTRF/TC. FlightSafety, the factory-authorized training provider, assisted Gulfstream with FAA/EASA certification for the G450. EVAS (Enhanced Visual Assurance System) HUD/HUD II training is available in the simulators. Gulfstream Enhanced Navigation training is available – ground school instruction covers ADS-C, CPDLC, WAAS and LPV approaches. Simulator instruction covers LPV approaches and WAAS. The Honeywell database is updated every 28 days. This allows you to fly anywhere in the world right from the classroom. FlightBag includes both pre-course study materials with iFlashCARDS and iFlightDECK.™ The interactive iFlightDECK™ provides visual navigation to the associated aircraft Pilot Training Handbook through the electronic Instrument Panel Poster. FlightBag serves as a single entry to learning cockpit functionality, systems, checklist flows and synoptics. Plus access to OEM documents: QRH, FMS Task List, G450 FAQ and Book of Why. All attendees in the G450 Program receive an iPad. You can download FlightBag via iTunes. Our Long Beach and Savannah Learning Centers are one-stop shops for Gulfstream G450 pilot, maintenance technician and flight attendant training. Maintenance technicians can take advantage of the exclusive Total Technical Training for the G450. In TTT, instructors from FlightSafety and Gulfstream collaborate to offer advanced, hands-on practical training. This unique method of instruction leverages Gulfstream’s knowledge of aircraft design, manufacturing and support with FlightSafety’s world-class training expertise. Advance your career while enhancing safety and improving dispatch reliability with FlightSafety’s exclusive Master Technician training for the Gulfstream G450. Master Technicians are recognized throughout the industry as having achieved the pinnacle of training for their aircraft.